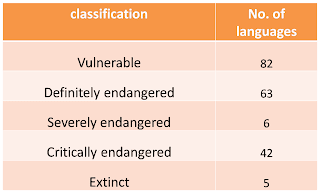 As per the UNESCO's Atlas of World’s Languages in Danger, India, with a total of 198 languages has the dubious distinction of having the highest number of endangered languages and reactions typically have ranged from complete dismissal to criticism of such classification in the Atlas. Unfortunately, there has been no systematic and official attempt for a proper scientific language census in India. The 1991 census of India found 1,576 "mother tongues" with separate grammatical structures and 1,796 languages classified as "other mother tongues". What’s surprising is that 3 per cent of India’s languages are spoken by an overwhelming 97 per cent of the population, while 97 per cent of the languages are spoken by just 3 per cent of the country’s inhabitants and these are precisely the languages that are vulnerable on the path of oblivion. Lets look into the issue in detail. 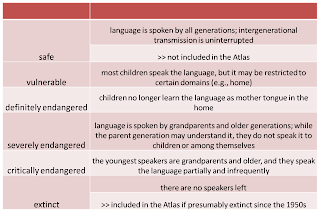 A language is endangered when its speakers cease to use it, use it in fewer and fewer domains, and/or stop passing it on to the next generation. Factors such as intergenerational language transmission, absolute number of speakers, proportion of speakers within the total population, shifts in domains of language use & response to new domains and media, availability of materials for language education and literacy, Government and institutional language attitudes and policies including official status and use, its own community members’ attitudes toward their own language and amount and quality of documentation, when considered together determine whether a language is endangered or not. A language disappears when its speakers disappear or when they shift to speaking another language – most often, a larger language used by a more powerful group. Increased migration and rapid urbanization often bring along the loss of traditional ways of life and a strong pressure to speak a dominant language that is – or is perceived to be – necessary for full civic participation and economic advancement. To Begin with, an accurate picture of the country’s languages does not exist. The last proper survey was the Linguistic Survey of India, often referred to as the LSI, conducted between 1894 and 1928, under the direction of George A. Grierson, an official of the Indian Civil Service which identified 364 languages and dialects at that time. There has been no attempt to track the inventory of languages in the country and their conservation. The census of India counts speakers rather than languages and does not recognize languages with less than 10,000 speakers as languages at all and just groups them as ‘others’ under major languages. Because of this, the very languages most at risk are the ones ignored by the state. The divide between major and minor languages and the official sidelining of the latter which is enshrined in the VIII schedule of the Indian Constitution – has also set off power struggles among linguistic communities, to the detriment of the weak. Schedule, currently an expandable list of 22 scheduled languages, obliges the state to help the languages prosper and make official documents available in them. The development of non scheduled languages on the other hand , requires no such obligation(Dasgupta). The census 1991 identifies about 3250 languages in India and it should be a matter of pride that we have such a rich multi-cultural society. Unfortunately, there has been almost a criminal neglect in preserving the minor languages spoken by few and with it, we are loosing a rich goldmine of cultural heritage and history along with. It is felt (and correctly so I feel) that languages are actually safer when they are left alone by the State. Ironically, where literacy has gone up, the local languages have dwindled because of the imposition of the state’s official language. Languages are humankind’s principle tools for interacting and for expressing ideas, emotions, knowledge, memories and values. Languages are also primary vehicles of cultural expressions and intangible cultural heritage, essential to the identity of individuals and groups. Safeguarding endangered languages is thus a crucial task in maintaining cultural diversity worldwide. For speaker communities, languages are the creations and the vectors of tradition. They support cultural identity and are an essential part of a community’s heritage. The 2003 Convention recognizes the vital role of language in the expression and transmission of living heritage. All intangible cultural heritage domains – from knowledge about the universe to rituals, performing arts to handicrafts – depend on language for their day-to-day practice and inter-generational transmission. Half of the 6,700 languages spoken, world over today are in danger of disappearing before the century ends, a process that can be slowed only if urgent action is taken by governments and speaker communities. UNESCO’s Endangered Languages Programme mobilizes international cooperation to focus attention on this grave situation and to promote innovative solutions from communities, experts and authorities. If my mother’s last wordsWere in Evenki? The most important thing that can be done to keep a language from disappearing is to create favourable conditions for its speakers to speak the language and teach it to their children. This often requires national policies that recognize and protect minority languages, education systems that promote mother-tongue instruction, and creative collaboration between community members and linguists to develop a writing system and introduce formal instruction in the language. Since the most crucial factor is the attitude of the speaker community toward its own language, it is essential to create a social and political environment that encourages multilingualism and respect for minority languages so that speaking such a language is an asset rather than a liability. Some languages now have so few speakers that they cannot be maintained, but linguists can, if the community so wishes, record as much of the language as possible so that it does not disappear without a trace. And its not just the language alone that's on the brink. So many of our traditions and festivals too face the same fate. I remember the way we used to decorate and celebrate "Janamashtmi" when I was in School during eighties. Families used to go around in the evenings visiting various decorations in the locality and it had an air of festivity all around. But now, I am not sure how many of the kids would even know that a festival by the name of Janamashtmi exists. Likewise, Sankashti or sankat hara Ganesh Chaturthi is celebrated in January every year. I used to look forward to the festival because we used to get "til ka laddu" as prasad. I confess that I forgot the festival this year and am not sure how many among the younger generation would know about such festivals. I am not preaching any religious practices but am trying to convey that such festivals of any religion have some cultural and often scientific significance and should not be lost in the name of progress and education. We must make a conscious effort to keep our languages and traditions alive and that's what will keep India going! What is the result of Linguistic Survey done along with Census 2011 recently?